A go-to place for athletic and casual shoes for the entire family, they have hundreds of brands to choose from in all the latest styles! 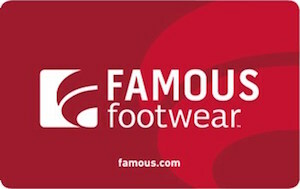 Buy your discounted Famous Footwear gift card and save money on Nike, Skechers, Bear Paw, ASICS, Vans and more. Your feet will thank you! With over 1,000 stores nationwide, as well as a dynamic website, using your Famous Footwear gift card will be easy! And just think, they also carry backpacks, drawstring bags, socks, and slippers. Finally, you can shop for the shoes and accessories you love, without damaging the checking account! The first store opened in 1960 and by the year 2000, they had become a leader in the industry. With departments in men, women, girls, boys, and accessories- all in the most sought after brands and latest trends- it’s easy to understand why. A Famous Footwear gift card bought at a discount is a sure way to go! Shop in one of their store locations for one on one customer service or shop online and receive free shipping on all orders of $75.00+. And just think, either way, you can join their Rewards program and earn redeemable points for your purchases- which means, even more, savings for you! Your Famous Footwear gift card will save you money on great shoes and accessories for the entire family! But your savings don’t have to end there! Cards2Cash works to save you money on many other stores and restaurants too! Check out our listings for Foot Locker, Nike, Rack Room Shoes, Adidas, and more! Believe me, when I say, we’ve got your dogs covered! Do you have a Famous Footwear gift card you aren’t going to use? Cards2Cash will buy your unwanted gift card from you and pay only the highest price possible for it! We buy gift cards for restaurants, Clothes stores, gas stations and more. Visit one of our retail locations for on the spot payment OR fill out our online form and we’ll get back to you with an offer for your card. Cards2Cash is the only place you need to go for saving money!